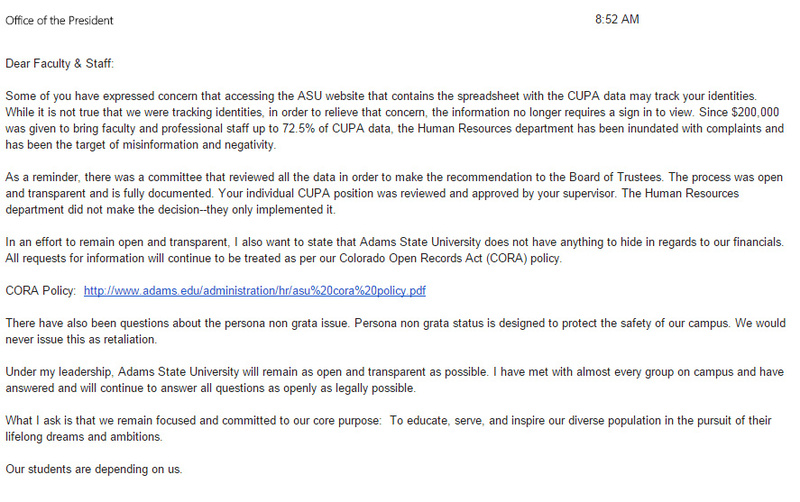 On October 12th, Watching Adams published a series of articles detailing how Adams State University (ASU) violates the Colorado Wage Act with delayed paychecks, violated the Colorado Open Records Act with a long overdue records response, and compromised employee privacy to access public information on their website. Readership of Watching Adams began to steadily climb into hundreds of visitors per day. Over 1,000 viewers visited the site on October 20th alone. Ledonne had been attending many such meetings for years while working as an adjunct faculty member and visiting professor. He recently attended the August 10th President’s Cabinet meeting to present on the Contingent Faculty and Instructor Council, in which he served as Vice Chair, as well as the September 17th meeting in which he took notes on his iPad. Ledonne responded by requesting clarification as to which meetings were “administrative” in nature and what policy or statute was being used to make this determination. 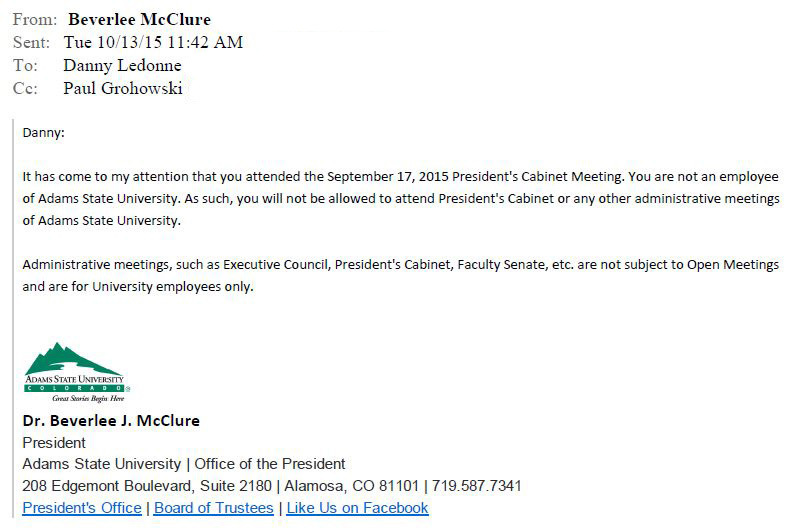 President McClure did not reply to this request. Instead, she set up the campus police chief outside the October 14th President’s Cabinet meeting in anticipation of Ledonne’s arrest. Ledonne stayed home and reportedly took a nap. 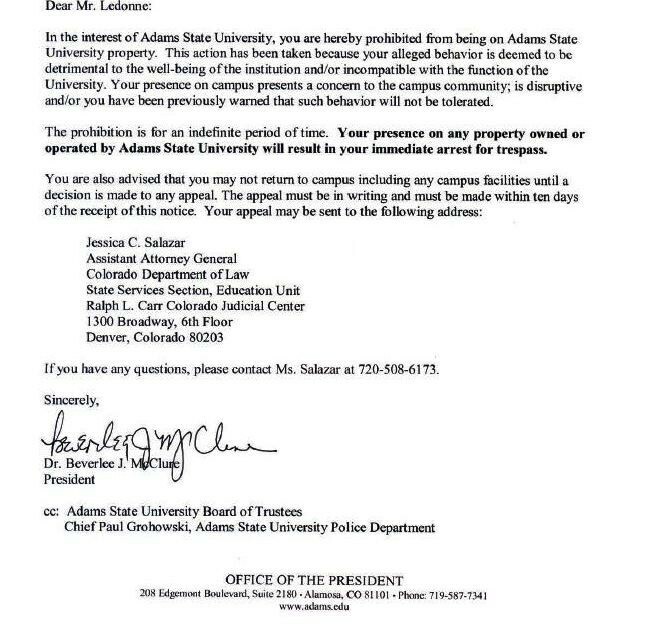 Later on the afternoon of October 14th, ASU police chief Paul Grohowski visited Ledonne at his residence and presented him with a letter from President McClure which declared that Ledonne was banned from campus “for an indefinite period of time” citing “alleged behavior” that has yet to be presented. 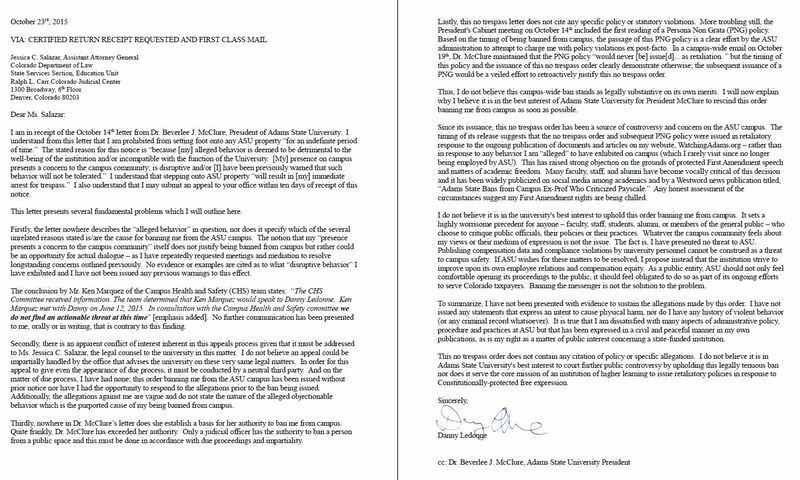 Ledonne shared the letter with Westword reporter Alan Prendergast, who published an article on October 19th titled, “Adams State bans from Campus Ex-Prof who Criticized Payscale.” To date, the article has been shared over 600 times on Facebook. 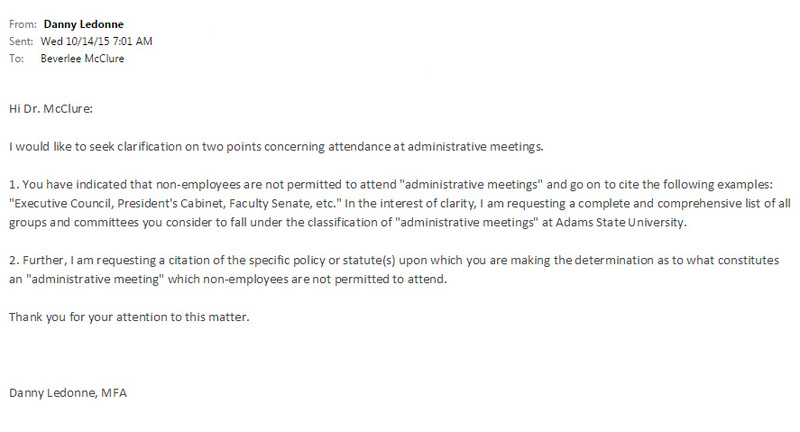 On October 23rd, Ledonne issued a response to the McClure decree banning him from campus. Ledonne argued that there has been no due process, no citation of policy violation, the appeals process presents a fundamental conflict of interest in that the university’s own attorney is also serving as the appellate judge, and that the issuance of the proposed PNG policy as justification for the ban would be ex post facto. Watching Adams will continue to follow this story for new developments. UPDATED 10/27/15: Assistant Attorney General Jessica Salazar called Danny Ledonne at 2:12pm to state that President McClure was mistaken in directing the appeal to her office. Salazar informed Ledonne to instead direct his appeal to Kurt Cary, ASU Associate Department Chair in Teacher Education and Interim Vice President of Finance and Government Relations. “It appears they are simply making this up as they go along” Ledonne observed. 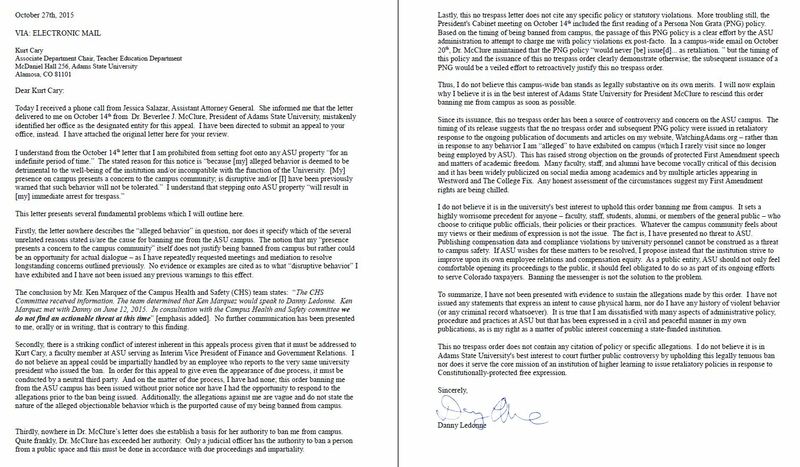 Ledonne has modified the original appeal letter to raise strong objection to an ASU employee who reports directly to the president as being the designated entity to handle this appeal.